This is the oldest picture in our records that shows the high altar in its original state. 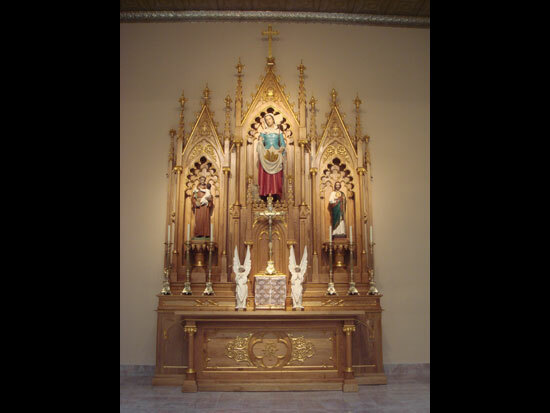 This is the high altar after it was restored during the Summer of 2009. This is the altar prior to it being put in storage for 42 years. It shows many of the modifications that occured throughout the years. Notice the change of color from #1 above and the disappearance of the ornaments. Our sanctuary prior to the installation of the restored high altar. Before - This is how the high altar looked after being abandoned for 42 years and poorly stored in several locations. After - This is the miraculous transformation of the lower regions of the high altar. Before - The main part that once held the tabernacle in the old church. After - The restored main part of the high altar. Three coats of varnish were necessary to apply to the butternut wood in order to give life to this piece. Before - The central niche lost several pieces throughout the years and was very deteriorated. After - The central niche shows a magnificent neo-gothic style. Before - The side niches were also in very poor condition. After - This is one of the side niches after being restored. This picture shows the latex molds created by Derek Rubio to make replicas of the lost ornaments. This is a crocket; it is made of plaster and finish with gold leaf. Over 200 ornaments were created to adorned the spires of the high altar. Copyright © 2010 (Saint Genevieve Church).